Africa’s urban population is the fastest growing globally. Can this be translated into economic growth and development? Africa’s future is urban. Quality of life for Africa’s city dwellers will, however, directly depend on the quality of urban governance. Urbanisation can spur development but under current conditions, it is more likely to compound Africa’s structural challenges. Making cities inclusive, safe, resilient and sustainable as stipulated in the UN’s Sustainable Development Goals is no easy task. Africa’s urban population is the fastest growing globally. In less than 20 years from now every second person in Africa is likely to live in a town or a city (see graph). This will total about 926 million people, or 438 million more than today; the equivalent of adding the current combined populations of Nigeria, Ethiopia, Egypt and Tanzania. 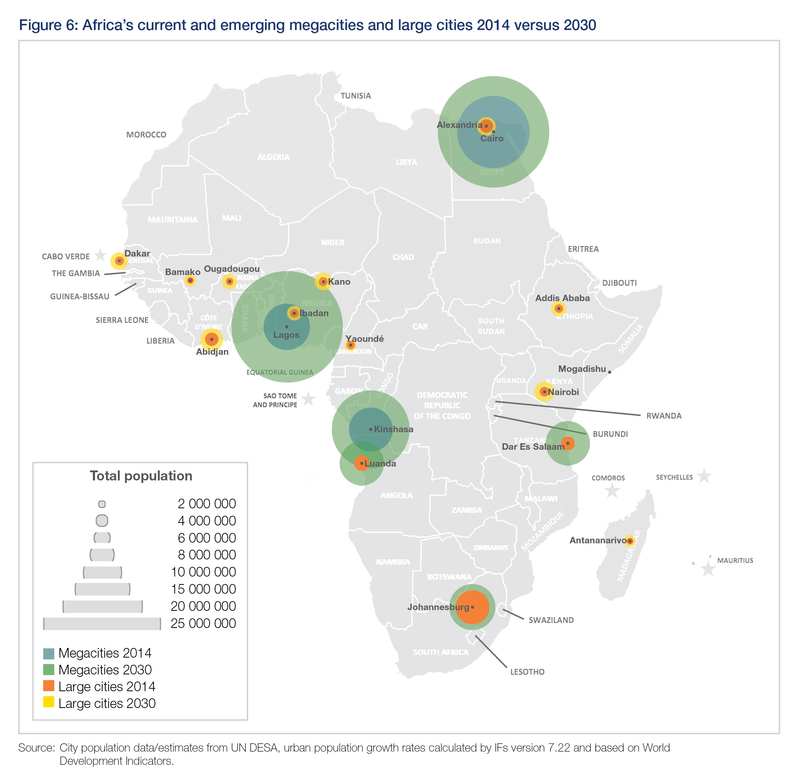 By 2030, six of the world’s 41 megacities will be in Africa (see map). The existing trio of Cairo, Lagos and Kinshasa will be joined by Johannesburg, Luanda and Dar es Salaam. Africa’s megacities absorb a significant share of national populations. They are key drivers of their countries’ economic performance and connect Africa to the global economy. A new African Futures paper forecasts that in 2030, Lagos, Cairo and Kinshasa will each have to cater for over 20 million people, while Luanda, Dar es Salaam and Johannesburg will have crossed the 10 million mark. By 2035, close to 30 million people could live in Lagos, turning Nigeria’s commercial hub into the largest megacity on the continent. At the same time, more than a third of Africa’s urban population is expected to live in West Africa. Can Africa’s urban development keep pace with such rapid and dramatic population increases? Will urbanisation on the continent in fact translate to a better life for all? It could, but slow economic structural transformation, poverty, inequality and violence are major stumbling blocks. So too is the exceptionally rapid pace of urban population growth. In fact, in most countries, urban population growth is outpacing economic, social and institutional development. The link between urbanisation and economic development in Africa is weaker than elsewhere in the world. In other words, urbanisation is not synonymous with economic development. Urban population growth has been outpacing economic development, partly because of the lack of productive employment creation. Africa will see a tremendous increase in the share of its working age population (aged 15 to 65 years), a potential booster for the economy. But to translate into economic development, the additional workers need skills and jobs and both are scarce. Sharp income inequalities in many African cities also mean that the contribution of economic growth to poverty reduction is limited. Africa has more urban poor than any other region in the world. And new research from the World Bank indicates that poverty could be urbanising. The typical urban resident in Africa lives in a slum or an informal settlement, lacks access to basic services, and has an informal low-wage and low-productivity job. And even though future improvements in urban poverty reduction are likely, the sheer number of poor people that lack access to services like improved water and sanitation is expected to increase dramatically. The African Economic Outlook 2016 predicts that Africa could see its slum population triple by 2050. The single most important driver of urbanisation in Africa is natural urban population growth or the predominance of births over deaths in urban areas. On average it accounts for around 60% of urban population growth. Rural-urban migration accounts for about 30%. People living in rural areas move to cities because service provision tends to be even worse in rural areas. Other factors that drive rural-urban migration include changing weather patterns, land pressures, natural disasters and conflict. Incidences of violence, whether politically or criminally motivated, are common in Africa’s cities and towns, and, like poverty, violence is urbanising. Riots and protests are on the rise. In South Africa’s Gauteng province (home to Johannesburg and Pretoria), for example, people took to the streets more than 1 900 times between 1 January 1997 and 1 September 2016 – more often than in any of the other current or emerging African megacities. Unplanned, overcrowded settlements populated with marginalised youth can be hotbeds for violence. Yet, rural areas are not necessarily safer than cities. In the Democratic Republic of the Congo and Nigeria, for example, armed conflict has triggered rural-urban migration, accelerating urbanisation. Since 2009 the Boko Haram insurgency in northeastern Nigeria has displaced an estimated 1.5 million people, and the city population of Maiduguri may have more than doubled to 2 million due to the influx of internally displaced people. What’s more, in the six countries that host Africa’s current and emerging megacities, rural residents seem to be more likely to fall victim to a terrorist attack than people living in urban areas. According to the Global Terrorism Database, between 2012 and 2015, 2 311 terrorist incidents occurred in Nigeria with only six of them in Lagos, 150 in Kano and 29 in Kaduna – three of the country’s major cities. If Africa’s population is to benefit from the urban transition, these interventions are key: improved urban governance and urban planning, and upscaled investments in infrastructure to expand service provision, particularly for the poor. Economic growth is vital but African economies must also accelerate structural transformation to boost productivity. Productive employment opportunities are central to tackling inequality and exclusion, especially for the young. Connecting rural economies and urban markets is also paramount. With urbanisation at the top of global and African development agendas, there is momentum for governments and other stakeholders to steer away from ad-hoc urban governance and work towards more inclusive and sustainable urban futures in Africa. This article was first published in Institute for Security Studies on 2 December 2016. Ciara Aucoin joined the ISS in April as a Researcher with the African Futures and Innovation team. Before that she was a Senior Researcher and Project Manager for the Armed Conflict Location and Event Dataset Project (ACLED). Until July 2014, Ciara was the Africa Programme Coordinator at the Conflict Prevention and Peace Forum at the Social Science Research Council in New York where she coordinated and facilitated high-level briefings for the UN Department of Peacekeeping Operations, the Department of Political Affairs and a number of field missions. She has a MSc in Development Practice from Trinity College Dublin and University College Dublin with a Master’s thesis on decentralisation and political participation in Rwanda.